If you want to build a gaming PC but you don't want a sizable system case cluttering up your office or living room environment then the options have been growing gradually over the years. For example, HEXUS recently reviewed the Corsair One i160 PC, revamped at CES 2019, coming in at 13 litres. Last month we looked at the appealing InWin A1 PLUS Mini-ITX case too, a case which offers 16.5 litres of build-space. Yesterday I received an email from 'Dr Zaber' of Poland, who thinks that things can still get smaller and better for compact PCs. The company's Sentry 2.0 PC case has recently hit Indiegogo and it claims to be "the world's first truly console-sized gaming PC chassis". This product is an evolution of a previous case, which has been tweaked over the last two years to bring more features and performance to the sub 7 litre volume case. 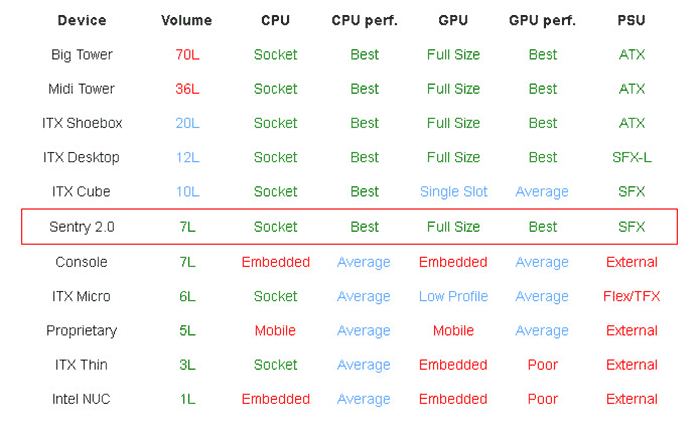 The above feature table comparison does a good job at highlighting the Sentry 2.0 offering. Highlights of the design are that it supports standard Mini-ITX motherboards, off-the-shelf dual-slot full-length 12-inch / 305mm long GPUs, 120mm AiO coolers (or 47mm tall air coolers for the CPU), and standard SFX PSUs. Elsewhere the design has room for up to 4x 2.5-inch SSDs, standard profile DIMMs, and uses a two-piece rigid PCB PCI-E riser for the GPU. The chassis is hewn from 1mm galvanised steel, weighs 2.6kg, and measures 340 x 310 x 66mm, 6.96 litres. On the front panel you have access to 2x USB 3.0 type A connectors, and a power/reset switch with red ring LED for convenience. In its sales pitch for the Sentry 2.0, Dr Zaber says it is a very portable system which can be packed up in a 17-inch laptop bag or backpack. Furthermore, the whole system acts as a headset hanger in vertical orientation. 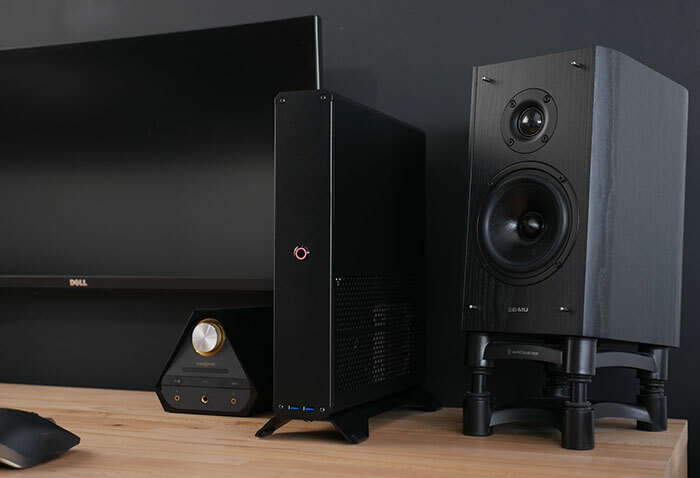 More appealing is the assertion that the Sentry 2.0 has been designed, revised and refined with the help of the enthusiasts over at HardOCP's forums and the SFF Forum. If you want to see a YouTube 'influencer' build a new Sentry 2.0 console-sized PC system, you can watch Linus Tech Tips do it (a 1hr 20 mins live build video), or watch Wendel from Level 1 Techs in the accelerated 12 minute video, embedded below. A versatile but pricey mid-tower chassis. previous case was Steel .. this one is not a steal. Looks nice , slightly pricey and meagre storage options . Go for it.